Oh my gosh- Serious Halloween Hangover over here friends! I love it, but it's exhausting, and secretly I'm over it by the time it gets here. But shh, don't actually tell anyone that! 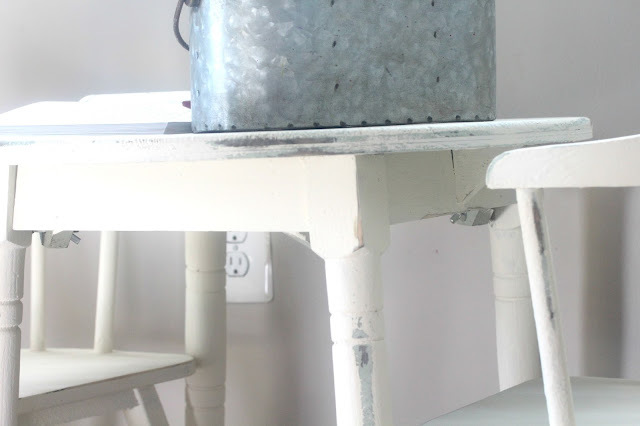 Today I wanted to share a fun little quick chalk paint furniture makeover with you! 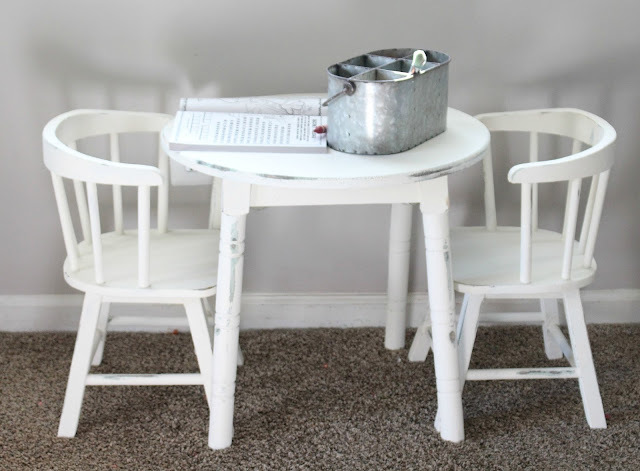 Last week in my Instagram videos I shared a little vintage kids table set I got for Savanna. While the bones of the set were super adorable and just what I was looking for, I didn't like the color. I mean, I didn't hate it, it just wasn't my style. So what's a girl to do under such circumstances? 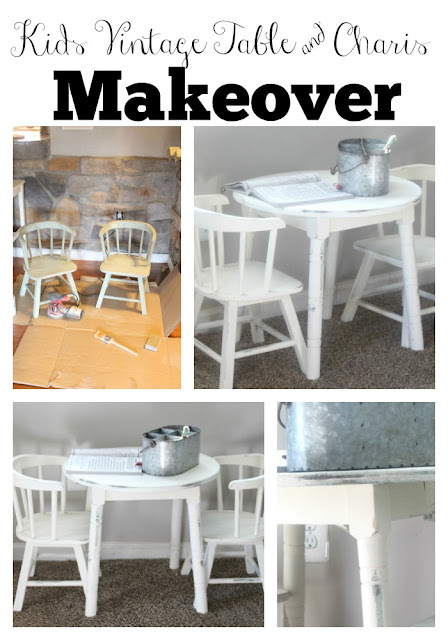 Chalk paint it of course! I know, I shocked you all with that, didn't I? And while I was bored one rainy afternoon last week, I went out to the garage to search out what paint colors I had on hand so I wouldn't have to wait for another order to come, and because rainy days make me anxious to knock of projects;) I was excited to see I had Annie Sloan 'OLD WHITE' chalk paint on hand, you can just never go wrong with it, amiright? Of course I AM! People make jokes with me that I paint and buy everything white, which is so NOT true. I love color, sometimes I like black, sometimes gray..and even beige! Trust me, I'm really adventurous! HA! Enough Chit-Chat, I know ya'll just came for the pictures. 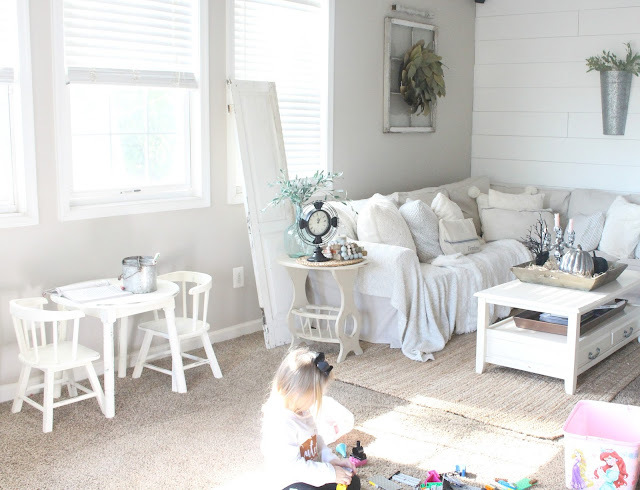 Savanna has two play tables, one in her playroom which is more for tea parties and then one in the living room where she colors and eats her snacks. This one was going to be in the living room so I really wanted it to blend in with the rest of the living room decor. White was the perfect choice if you ask me. I kept things simple and just sanded down some of the edges to stick with the vintage feel the table originally had. Savanna says she "loves it so much!" Hehe, she is totally me. Just a little shorter. The originally finish was a bit bumpy, and even with a sander I wasn't able to get rid of all of the texture, but that's okay. I just think it adds to the vintage chippy vibes. Don't you? So what do you guys think? I'm pretty happy with how it turned out and think it looks just adorable in the living room. I'm sure one day I'll miss all the miniature furniture all around! I completely forgot to take a picture of the entire table before I started painting. Go figure. I need to get better about that but I'm just so "in the moment, ya know?" haha! Here's a before of the chairs, you can see the original chippy green color which for some reason looks more blue on camera. I swear it's green. I'd love to hear from you guys, you can chat with me on Instagram or Facebook. I always just LOVE hearing from you!! It makes my little heart so so happy! Seriously! Hope you all had a great day! Are any of you working on any projects currently? This is perfect and so so cute! The table is precious! It came out perfect. 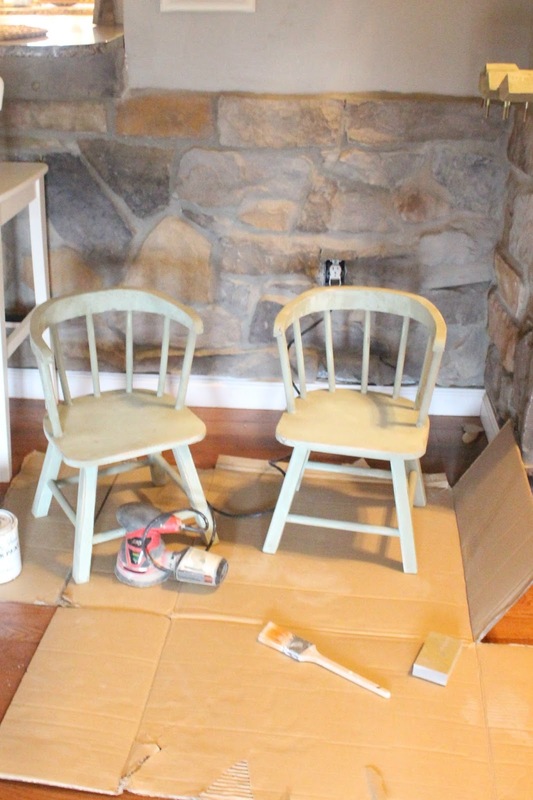 Chalk paint really is the best! 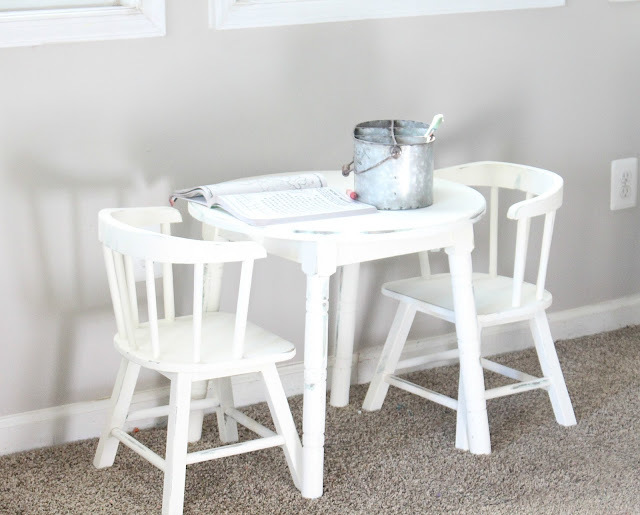 I LOVE the style of the table and chairs. Does it say anywhere who originally made it? I've been looking for something just like it for my 2 little ones.